Man, I had to do some figuring on this book. 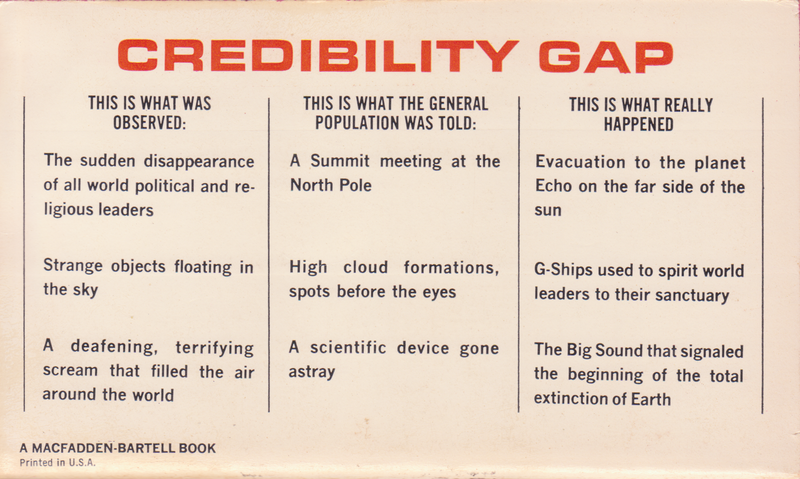 Not because of the plot, which was fairly standard (I have dubbed it a type-a British government science fiction plot, more on that later), but because of the back cover. There was a lot of design work put into it. Not a huge amount, but more than I see on the back of most books. Here, I scanned it so you can see for yourself. It’s the best I could do. WordPress did not want me to do anything to give you that back up in the summary bit, so I just made it into one big column and lost a lot of the oomph. I like that back cover. The best thing is that it’s also accurate. The protagonist works for the government. This leads to wife troubles. I even seem to remember Arthur C. Clarke doing that a bit. Mostly I remember a tiny plot element from 2010, where Dr. Heywood Floyd’s wife leaves him because he spends so much time in space. It’s realistic, sure, but the Brits seem to have an obsession with what a sci-fi plot can do to a marriage. I like the cover, though. Are those astronauts on the Moon? Are they waving at that space ship, or at the exploding Earth above them? I like to think they’re each waving at one of those things. It would give those two tiny astronauts more character than anyone in the text. Bill has been away for a long time working on a super-secret project. That project is done now so he’s come back home to find his wife in the process of leaving him. She just can’t take it anymore. The long hours, the secrecy, all that kind of stuff. He tries to convince her to stay, but she’s set on going. It’s all very sad. He does manage to convince her to stay one more night. Any hopes of make-up sexytimes are dashed when THE BIG SOUND happens. That’s all it is. A great big noise. And it’s everywhere. It’s not really a boom so much as a woom woom woom thoom room woooooom. Bill knows what it is and it fills him with a sort of resigned dread. He can’t talk about it, though. It’s secret. This drives a wedge further between him and Marty. Then Laura shows up. Laura is Marty’s sister. She and Bill are attracted to one another. It’s more of a sexual tension, and Bill is convinced he’d never act on it because he loves Marty. They almost had a thing many years ago, and the knowledge that he chickened out preys on him . There’s also the fact that Laura’s husband is gone. He decided he was a homosexual several years ago. This has left Laura a bit obsessed with the fact that all men are latent homosexuals. It’s a running theme with her all through the book, up to the point where she finally seduces Bill by saying he’s just another secret gay and he finally just cracks and proves that he’s not. There’s nothing I’d say is anti-gay about the book, really, and Laura’s attitudes seem pretty standard for the sixties. Heck, they’re pretty standard for today. She’s never a nice character, but it’s understandable that she’d be preoccupied with “secret male homosexuality” after losing her husband to it. Not really, but it’s close. There’s also the part where Marty is cheating on Bill, and the more minor element of the end of the world. So Bill was working on the secret project that determined that the world was ending. It’s a natural phenomenon, set up by the alignment of four heavenly bodies. One of them is the Earth. Two others are the Sun and Moon. And the fourth is Echo, the counter-Earth. It’s something to do with magnetic fields aligning in a certain way and it causes the Earth to slow down in its rotation, causing massive flooding, earthquakes, and that whole kind of thing. It’s part of a cycle that hits every 11,000 years (apparently to the day, more on that later), and some archaeological evidence has backed up the fact that there were once previous civilizations whose ruins follow this pattern. This is set to happen two days from the beginning of the book. The Big Sound (as well as another one the next night) are phenomena that precede the eventual cataclysm. It’s okay, though, because we have space ships that can take us to Echo to be safe. Did I say “us?” Well, I meant a few of us. Government leaders, religious leaders, assorted scientists, military guys and Bill. His wife can come too, if he wants her to. The whole emotional interplay between Bill, Marty, and Laura means that he’s not sure he wants to take either Marty or Laura with him. What’s not mentioned is the fact that Laura has kids, and I imagine she wouldn’t want to go if it means leaving those kids behind. Marty, on the other hand, doesn’t love him anymore and is, in fact, cheating on him, so she’s not a very good choice either. That part was dwelt upon in more detail. The majority of the book is all about Bill stressing out over things. Which is understandable, but not very fun to read about. What is entertaining is the science fiction we get once Bill starts spilling the beans. First he spills them to Marty, then to a guy named Richard. Richard is a newspaperman, but he’s also the guy Marty is cheating on Bill with, although Bill doesn’t know that until most of the way through the book. Okay, so Echo. It’s counter-Earth, which I mentioned. At some point in pre-history Earth did an “amoeba split” that produced Echo, which somehow drifted to the other side of the Sun and stayed there. Never mind physics. Just take it for what it is. We never knew about Echo before because, well, it’s hard to see through the Sun. Even radio-scopes didn’t know it was there. We had to physically go to the other side before we could see it. Again, never mind physics and the fact that we could probably detect an Earth-sized planet through looking at its gravitational effects or that such an orbit wouldn’t be stable for us or Echo. Just keep reading. Echo had its own life on it, which evolved. I guess you can blame convergent evolution, but the people on Echo are humans. Oh, how did we get over there? (I heard you asking that.) Well, we used G-Ships, obviously. A G-Ship is made out of a special kind of metal that can change the way it responds to gravity. Space travel is super easy with them. Also, they’re UFOs. They work by cancelling the gravity to everything except the thing you’re going toward. Somehow that’s supposed to get you to counter-Earth without fiddling with orbits or plunging straight into the Sun. The people over there were hostile and would not have taken lightly to our colonizing their planet, so we killed them all. And now we’re ready to head over. The important people have already gone over. Everybody on Earth thinks they’re at some kind of summit at the North Pole. Why would somebody hold a summit there? I know it’s neutral ground, but it’s really hard to get to and even harder to stay. That seems silly. But I guess it’s not as silly as going to counter-Earth in UFOs. There’s not enough of the special metal to make enough UFOs to take everybody on Earth over, so there had to be a choice. It was decided that the best choice was politicians and religious leaders and military folk. Of note, Bill was one of the first people to try out these newfangled UFOs and made one of the first round-trips to Echo and back. Imagine having to keep that from your wife. The clock’s ticking down. Bill is telling all this to Richard. Eventually he learns that Richard is shacking up with his wife. Also he learns that Richard doesn’t really work for the newspaper, he’s a dude from the government sent to make sure that Bill isn’t telling anybody about the fact that the world is about to end. Oops. Laura’s ex-husband, Basil (is there any name more British than Basil?) shows up and starts saying some things. Richard kills him and leaves him in a forest. Another guy, Reynolds, shows up. He lands a UFO in the middle of the street as the clock ticks down the last hour. He has an important announcement to make: Echo is completely boned. See, nobody thought to consider the idea that this giant magnetic problem doohickey might also affect counter-Earth too. Well, it does. Or rather it did. For some reason it happens to Echo about 48 hours before it happens to Earth. You know all those political, religious, and military leaders? Ruh-roh. So Reynolds has a big plan and he gets everybody on board. His big plan is to hijack this UFO (tick that one off) and then abduct a bunch of children and take them to space with him. At least he doesn’t get the children to come to the UFO by offering them candy. Bill and all the other adults are totally on board with this. The reason for this is that Reynolds wants to start a fresh new humanity, without a lot of the old prejudices and hostilities. A running theme in this book has been Noah, and how the ark may not have been as the Bible describes it, but may have been something more technologically advanced, say a submarine or a space ship. Reynolds wants to be a new Noah, and he takes some kids on board the UFO with him and takes them to space for forty days, after which he’ll land again and civilization can start over. All this came out of nowhere to me. I didn’t even know there was a guy named Reynolds until this point. So with humanity saved in this way, Bill doesn’t have to stress out over which woman to take to Echo with him anymore. The majority of the plot is rendered moot. And then the world ends. The crony makes the big announcement: this manuscript dates to 11,000 years and two days ago! The camera zooms in on the Prime Minister’s face, ominous music plays, and the book ends. So I guess that bit tells us that the next round of humanity didn’t even have the time to prepare that we did? We sent all those children into space just so civilization could live another 11,000 years and then go extinct for real that time? 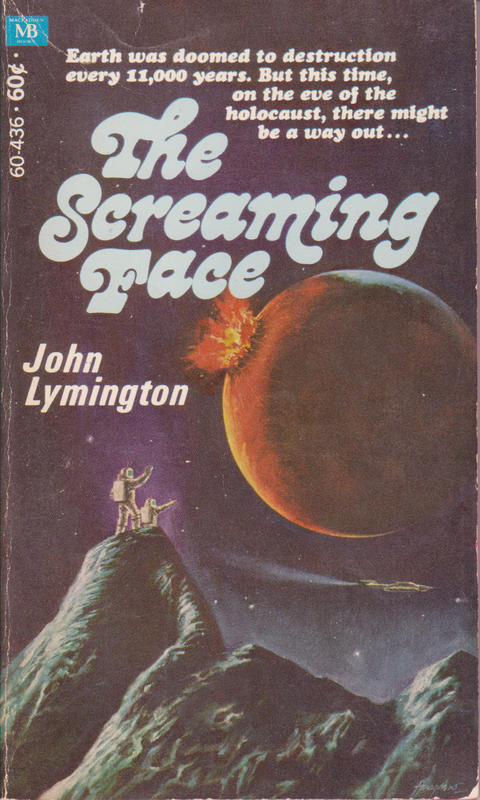 Way to be a pessimist, John Lymington. This book toed the line between boring and fun to read. I might make fun of this type of British science fiction for having what is essentially the same plot in so many books, but at least it’s a plot that I seem to enjoy without knowing why. I like reading interpersonal tales. These kinds of books revel in that. I like science fiction where the human element takes the primary role. These books do that as well. On the other hand, after the whole thing is over and done it feels like I didn’t read a science fiction book so much as a book about people who have problems. Those problems have a backdrop wherein major things are happening, sure, but sometimes I think those major things could be replaced by almost anything. What would the story have been like if there had been a summit, and only Bill knew that the talks had broken down, an incident had happened, and now there were only two days before the Soviets launched a nuclear hellstorm? Would that still be a science fiction novel? Did Tom Clancy write science fiction? So even though the book held me tight for the three hours it took me to read it, I’m still going to call it a meh read. The characters, even though they were the point of the book, were flat and sometimes lifeless. They didn’t much feel like people, more like robots that behaved in certain programmed ways until the book ended. D.G. Compton does a much better job at these types of books. Give it a read if British psychological thrillers are your cup of tea (see what I did there? ), but don’t come at this book thinking it’s going to be great sci-fi, because it’s neither. Eh, considering that most life on Earth must have survived myriads of those catastrophes over and over again, I guess it can’t be that bad.